Whether you’re looking to upgrade to a better pontoon, a tritoon, or have decided that boating is just not the lifestyle for you (hard to believe, but that does happen), you might be thinking of selling your ‘toon. And, much like selling anything bigger than a bike, selling a boat is no easy job. In fact, it can turn into a real full-time job – and if you’re not ready to deal with that yourself, you might need to appeal to a boat dealer to help you out. Still, whether you sell the boat yourself or get a dealer to help, here are 4 essential steps for anyone who wants to sell their pontoon. Before you price the boat or list it on eBay, you need to get your boat in the best condition possible. That implies removing all your personal belongings from the boat (those that you don’t intend to sell with it), pump out the holding tank, check and fix your engine if needed, and, of course, clean the boat. Make sure your ‘toon is clean, shiny, waxed, and it smells good – no one wants to get to get an old smelly boat and deal with the cleaning themselves, no matter how great the price is. Pricing your boat right is extremely important. You don’t want to sell it dirt cheap if it’s fully functional and in overall good condition, but you don’t want to charge the original retail price for a used boat either. If you’re selling the boat yourself, make sure you do your research before pricing it – sites like boats.com and boattrader.com can give you a good idea of how much you should charge for a boat like yours – maybe not the exact model, but something similar in size, engine power, and other specs. Note that the condition and even location of the seller affects boat prices – Florida boats are often cheaper due to exposure to saltwater and high temperatures. Exposure can be a problem when you’re selling a boat by yourself. We recommend trying eBay or Craigslist for a wider audience, or, if you’re trying to sell locally and save on shipping costs and hassle, find a place on the side of a busy road/highway and place it there, with your phone number and any other contact details. You might be surprised at how many calls you’ll be getting! The key here is not to keep it in some obscure place in the marina – somewhere where only you and your boating buddies pass by – you’re just missing out on customers. Finally, if all else fails, or you don’t feel like dealing with the whole thing by yourself, get a dealer involved. Yes, you might have to pay them a pretty penny for the help, but hey, you lose some, you win some. A good dealer will take care of pricing, exposure, and sometimes even boat conditioning for a fee. They’ll also show customers around your boat for you, and take care of all the logistics and payment processing. 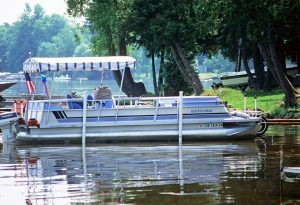 While selling a pontoon is definitely no easy thing to do, it is definitely possible, even by yourself. Just be prepared to spend a few weeks on it – and if you can’t be bothered, just get some help from a boat dealer. Hi Jerry, thanks for these tips, we really appreciate it. I finally decided to upgrade to a Suncatcher G3 and I need to get rid of my old boat. Not gonna lie I’m kind of sad to let go of it but I’m sure the now ‘toon will bring me so much more. Honestly after reading through this I’m thinking more and more about leaving it to a professional dealer, selling it on your own sounds like quite the hassle. Now if only I could find a realiable dealer around this are that won’t charge me an arm and a leg..